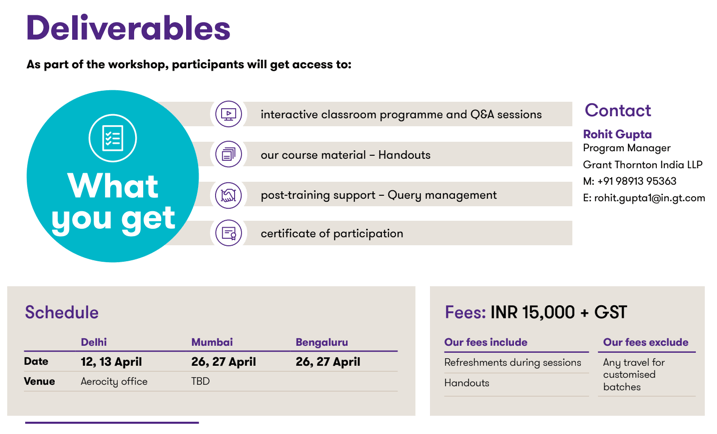 Interested in GST Workshop by Grant Thornton ? GST is a comprehensive indirect tax levied on goods as well as services, subsuming multiple taxes, in line with the concept of 'one nation, one tax'. Discussion on recent changes including discussion on the revised GST return design and process, important advance rulings, etc. Learning & Development is an upskilling service offering of Grant Thornton in India providing result-oriented finance and accounting courses to professionals and students. Our impactful programmes can be customized to help you gain skills and capabilities in your area of interest. In a digital age, we strongly believe in retaining the advantages of a classroom environment, making the most of group learning while paying attention to resolving individual queries. Our trainers are seasoned experts who will share their journey along with best practices followed in the industry. Learning & Development Academy will leverage Grant Thornton India LLP's rich experience in different domains across various industries and its knowledge base to share practical insights, helping participants understand and learn contemporary complex concepts.